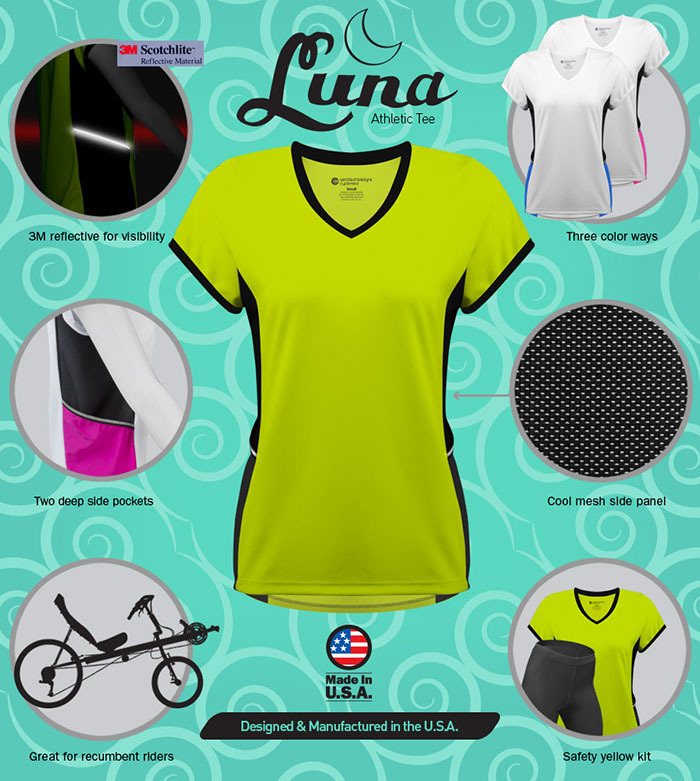 Aero Tech Designs Women's Luna Athletic Tee - Great for Recumbent Riders! Attention all recumbent riders! 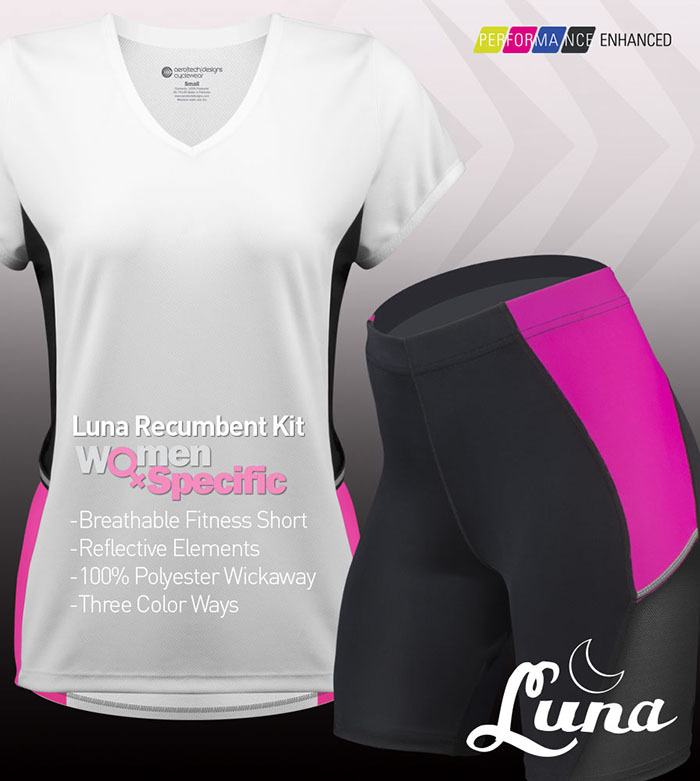 Recline and unwind in style while wearing the Women’s Luna Athletic Tee, created and manufactured by Aero Tech Designs! The Luna Athletic Tee is the perfect combination of fitness function and fashion flair, using only the highest-quality performance fabrics to offer complete freedom of movement with style. Designed using WickAway, a sports specialty polyester blend, the Luna Athletic Tee will keep you dry and cool to help you Ride Longer and Feel Stronger. The fabric also offers 4-Way stretch to fit around your feminine curves and move with your body through the cycling motion, almost like a second skin. No tugging, snagging, or baggy creases! Just smooth sailing on the long road ahead. The fabric is soft on the skin, yet rugged and durable against abrasion, perfect for the avid female recumbent cyclist. Underneath each arm of the Luna Athletic Tee features a mesh panel that helps vent excess heat and moisture. A modern and sleek style design! Need space for your things? This athletic tee has two expandable side pockets (one on each side) for all your drinks, snacks, gels, and electronics. 3M Scotchlite reflective trim is added to the top of each pocket to keep you visible during low-light and nighttime conditions. The Luna Athletic Tee also has a feminine V-neckline and is cut to be a slenderizing fit for all female body types. You’ll be sure to make even the non-recumbent cyclists turn heads. The Luna Athletic Tee works amazing as a jersey for recumbent cycling, but can also be utilized for just about any other sport or fitness activity: yoga, running, pilates, kickboxing, dance, etc. Wear it to the gym to lift weights or do machine work-outs. Go jogging in the park or use it for a race. The possibilities are endless! Pair it with our Luna Recumbent Compression Shorts for the matching kit! ATD Women's Luna Athletic Tee Made in USA! The fabric is designed with channeled and crimped yarns that are engineered to transport your body's perspiration to the outer layers of the fabric through a capillary action. Love this shirt! I have the yellow one, and it's bright and easily seen in shady areas, and it's cool, even on hot humid days. Best of all, the side pockets are big enough for all my biking essentials - keys, cash, cards, phone -, deep enough that I felt confident I wouldn't lose my stuff, and very convenient to use. The fabric is light, and the shirt is made well. I bought it because I like the design, with the v-neck and cap sleeves. It does run small - so I have to exchange for a size larger, which could even be slightly small - can't rely on the size chart... I'm hoping the exchange fits so that I can wear it without having to wait again. Overall, I recommend it, just be sure to buy at least one size up.